Gender-nonconforming artist Alok Vaid-Menon speaks to students about the challenges transgender people face. They also performed poetry at the event in Lutkin Hall on Friday, sponsored by the Asian Pacific American Coalition and South Asian Student Alliance. Vaid-Menon, a Malayali gender nonconforming artist who uses “they/them/their” pronouns, spoke Friday about the challenges transgender people of color face. 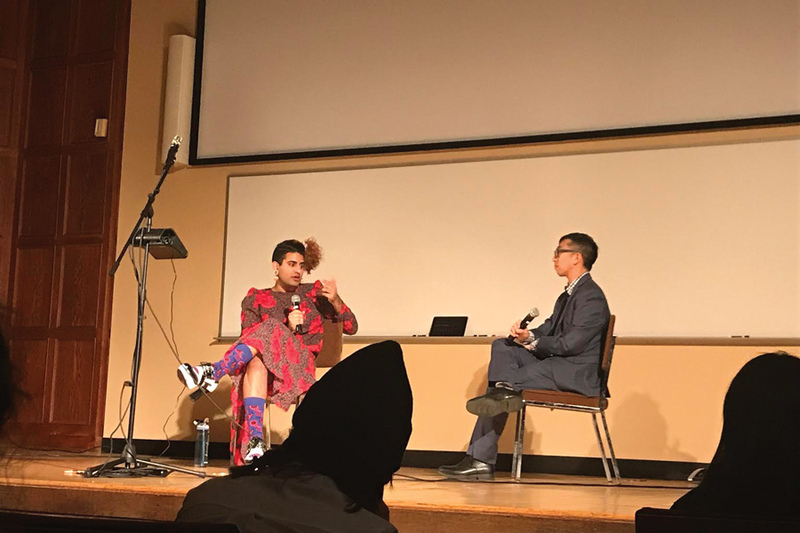 Vaid-Menon spoke in Lutkin Hall as the fall speaker at an event hosted by the Asian Pacific American Coalition and South Asian Student Alliance. Asian American Studies Prof. Douglas Ishii, who moderated the event, told The Daily that Vaid-Menon’s work reveals the need for intersectional perspectives that go beyond “superficial naming” of terms and identities, which Vaid-Menon discussed in their performance. Communication senior Dominique Teoh told The Daily he did not know what to expect going into the event, but was “blown away” by Vaid-Menon’s performance. Teoh said he knew a few gender nonconforming people in his family. Vaid-Menon used a combination of spoken-word poetry and stand-up comedy to discuss their experiences with identity and oppression imposed by Western society. They said colonization has led to the suppression of Asian cultures, which in turn have caused transgender communities to be alienated. Once they started to learn their own history — not “white history” — Vaid-Menon said they found that gender was imposed by Christianity and Western society.